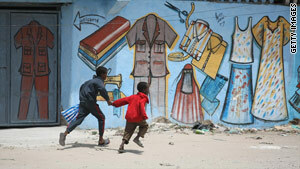 Children run past the frontline amid clashes between Somali soldiers and insurgents in August 2009. United Nations (CNN) -- The U.N. Security Council slapped Eritrea with an arms embargo and further sanctions Wednesday for its role in aiding rebels in Somalia and refusing to withdraw from a border dispute with Djibouti. The council approved the resolution with veto-holder China abstaining and Libya, the current chair of the African Union, as the sole vote against the measure. Eritrean Ambassador Araya Desta denounced the action, calling the resolution "shameful" and based on "fabricated lies mainly concocted by the Ethiopian regime and the U.S. administration." Desta also denied that his country has ever given military finance to opponents of the Somalian government. "Somalis are our brothers," he said. Somalian Ambassador Elmi Ahmed Duale expressed full support for the resolution, saying Eritrea is a "major negative factor" in his country's conflict. He called the action a "very positive step" toward resolving the "insecurity situation in the Horn of Africa" and said he hopes Eritrea will be "persuaded accordingly." Duale also cited a lack of justification in the nation's "moves against Djibouti" and "innumerate hostile activities against Somalia," including serving as a "safe haven to known terrorists" and enabling a "flow of arms and resources" to extremist groups. The resolution bans weapon sales to and from Eritrea, which has been known to supply weapons to opponents of the Somali government, including the Islamist insurgent group Al-Shabaab. It also imposes an asset freeze, and restricts the travel of those who violate the terms of the embargo and impede the resolution of the border conflict with Djibouti -- including black-listed individuals from Eritrea's political and military leadership. U.N. member states are urged by the resolution to conduct inspections on suspicious sea and air shipments "to and from Somalia and Eritrea." U.S. Ambassador Susan Rice said the council acted "not hastily, not aggressively," but with the aim of seeking constructive dialogue with the Eritrean government. She said members of the Security Council have repeatedly urged Eritrea "not to continue actions which destabilize Somalia" and to "resolve peacefully" the border skirmish with Djibouti. "We do not see this as the door closing on Eritrea but, on the contrary, we view this as another opportunity for Eritrea to play a more responsible and constructive role in the region," Rice said. Deputy Libyan Ambassador Ibrahim Dabbash said adoption of the resolution was "too hasty" and was done with an "unrealistic point of view," adding that "sanctions are not the ideal way of resolving problems" as they would only exacerbate the humanitarian situation in the region. He explained his decision to vote against the measure by referring to his commitment to not take part in sanctions against "any African country whatsoever" as Libya has been "a victim of sanctions for many years." One of the resolution's main supporters is Djibouti. "Enough is enough," said Djibouti's ambassador, Roble Olhaye, on the border conflict, which he said has left his "small, peace-loving and pragmatic" country with only the "option of war." Given Eritrea's "legendary defiance," Olhaye described the sanctions as "inevitable" and welcomed the fact "that justice is done at last." The African Union and the Intergovernmental Authority on Development in eastern Africa have been pushing for U.N. sanctions to punish Eritrea for its support of Somali rebels since mid-2009.